Tagged with " florida family vacation"
The question we all might be asking ourselves is; are we there yet? Here below we bring to you a list of the Top Florida Travel Spots for the family to enjoy. So if you haven’t yet planned your next summer adventure, then keep a close look at this list to be able to decide on the best travel spot in Florida to visit. Best For: The outdoorsy, nature-loving family who prefers creature comforts over sleeping bags. Stay: Amelia Island Plantation spans the entire south end of the island before merging into a state park. Its stunning 3½-mile stretch of dune-studded beach and hundreds of acres of maritime forest and marshland give the resort an unspoiled, natural feel. Play: Start the day paddling through the salt marsh on a kayak from Walker’s Landing. At low tide you can walk around on mud flats and see dolphins, manatees and crabs (don’t worry; it’s too salty for alligators!). Next, hop on a bike or a Segway from Amelia’s Wheels to explore the seven miles of tree-canopied trails. Don’t miss the Sunken Forest with wooden overlooks for fabulous views of the Atlantic over the treetops. End the day on the meandering boardwalks at Drummond Point Park, the best place to see herons and egrets as the sun sets over the endless expanse of marshland. Go Natural: Head to the Nature Center for children’s programs like shark-tooth hunts and crabbing with the center’s “master naturalist” Christina Nelson. Meet Rex, the red-bellied turtle, in the indoor zoo. Rent fishing rods from Amelia Angler to catch redfish and seatrout right offshore, or head to the private Aury Island, where you can go marsh fishing and the little ones can have fun on the play- ground while you wait for a bite. Eat: Sip sweet tea and nibble on chocolate crunch cake by the lake at Marche Burette Market & Deli. In the evening, try the grouper in sauvignon-blanc sauce at the Verandah restaurant, or for some- thing more casual, go for the “best burger on the island,” served with fried green beans, at the Falcon’s Nest. On Friday nights in summer, locals gather at the Boardwalk Bash, home to $1 beers and live music. For more information, please visit: ameliaisland.com. Best For: The families who really enjoy that perfect mix of natural and urban beach surroundings. Stay: Mangroves border the Naples Grande Beach Resort, where you’ll find some 23 acres of green and raised wooden walkways winding their way to the shore. (An open-air shuttle whisks you down to the beach.) Bungalows with split floor plans set in a Zen garden are ideal for families. Play: An hour’s drive from the Everglades, Naples is a jumping-off point for trips into Florida’s most famous swamp. Everglades Excursions, with its air-conditioned van (translation: no crabby kids on a hot summer day), transports guests from Naples to the wetlands. Fly across the river of grass pro- pelled by wind on an airboat as you search for gators; wrap the half-day tour with a visit to Everglades City, the gateway to the Ten Thousand Islands. Back in town catch one of the Naples Players Youth Theatre’s summer productions—Annie, 101 Dalmatians and Cats—at the Sugden Theater. Eat: The no-frills, laid-back Mel’s Diner serves chili-cheese fries, beer-battered onion rings and comfort food like buttermilk-fried chicken. If the kids want to watch boats, Pinchers Crab Shack on the Gordon River has great viewing, along with plenty of blue, king, snow and stone crabs. For more information, please visit: paradisecoast.com. Best For: Families who can’t resist the Disney attraction but also like to explore new territory too. Stay: Make a splash at the new Key West-themed CoCo Key Hotel and Water Resort. Fourteen water slides, a zero-entry play pool and a water-soaked jungle gym indulge all age groups. And at the family-friendly ChampionsGate nearby, float down a lazy river past shooting water cannons, while dad plays 36 holes. An infinity pool, water slide and tower round out the alfresco fun. Play: Orlando’s latest attraction, the Wizarding World of Harry Potter at Universal Orlando’s Islands of Adventure, brings to life the popular children’s series with sets and thrill rides designed to immerse guests in the quirky universe created by the Harry Potter books as well as the films. Even the line for the attraction is fun as it winds though a replica of Hogwarts Castle. For those who prefer the marqueeDisney experience, Magic Kingdom reintroduces its popular Main Street Electrical Parade. While the nearly half a million lights follow Tinker Bell as she sprinkles pixie dust down Main Street. Eat: Islands of Adventure’s Confisco Grille offers a character breakfast on Thursdays and Sundays; similar dinners take place on Wednesdays and Saturdays at the Royal Pacific Hotel’s Islands Dining Room. Just outside the theme parks, the Dessert Lady specializes in satisfying your sweet tooth—the peanut-butter pie is not to be missed! 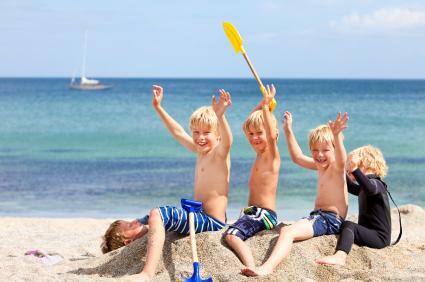 So, if you are looking for an exciting family vacation location then one of these Top Florida Travel spots are the best choices for you. Start to plan your visit and you will have an exciting and joyful time.